.NET code protection. Code Extension. Other .NET obfuscators' vendors offer you to compact your final .NET application to remove some unneeded elements: classes and class members. What is the compaction? You were going to use some class you have designed but for some reason you do not use it in your .NET application code. Finally you forgot about that class. The class script is stored in your code, compiled, and actually increases your final .NET executable. The compaction removes this kind of code snippets from your final assembly. This feature is obviously for non-orderly coders. 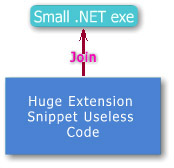 At the same time we offer you to extend your .NET product with unneeded elements by using Skater .NET Obfuscator. Why may you need the bytecode extension? The PC world is changed in a different way and we do not think about how to save space on our hard drive, CD, and other media. The space is not significant now and we do not need to be worry about how to produce a much smaller application but we still need to protect our intellectual property. As part of the complete protection of your application, it is possible to insert unneeded elements and then obfuscate them as well. It will increase your assembly final size but will give your application one more security layer. Potential hacker will be deceived seeing the plenty of obfuscated code and it will be harder to figure out what part of your secured assembly is meaningful and which is not. For example, you may have to secure a very small application. The application has one class with a single method (function, procedure, sub etc.) inside. Let say the executable is a key that activates your licensed software you are distributing to end-users. Potential hacker intends to break and decipher the license key exe to share your software with everyone around the world for free. Since the executable is actually small in size the hacker can spend some time to successfully recover your code even it was obfuscated. We offer to extend your executable bytecode with an additional unneeded meaningless code. Then Skater will obfuscate the senseless code snippet along with the main code of your application together. It will give one more protection level. 1. The Snippet has to be a single class. 2. The name of the class has to be 'Snippet'. The name will be obfuscated. 3. You must be able to compile the code. Please check compilation before obfuscation. This entire process is performed on bytecode or MSIL, not .NET source code.